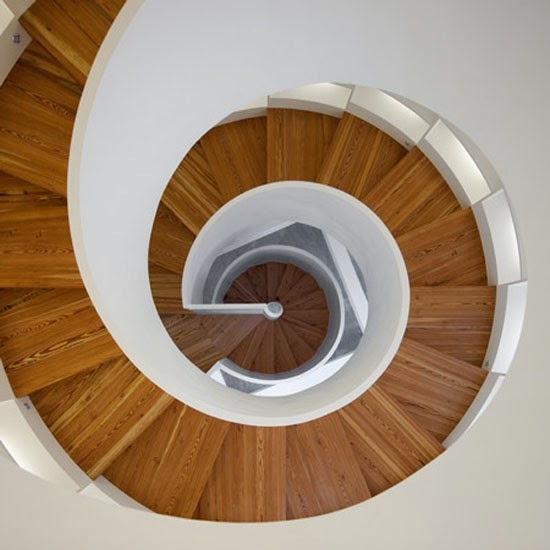 Extraordinarily beautiful staircase from the Portuguese architect Manuel Maia Gomes (Manuel Maia Gomes) has become the "heart" and the exquisite decoration of a small house in Portugal in the past belonged to the poet of the nineteenth century. After reconstruction in the building will be opened a literary center. We have already written about the unusual decisions stairs, among which was a lovely staircase library integrated into the stage. At this time, the snow-white staircase library graceful spiral shoots up through all three floors of the building called House Antero de Quental . On the second floor, acting as shelving for books and fencing for most of the ladder, up from the wooden steps rise roomy bookshelves made ​​of translucent plexiglass and decorative lighting system. This library can put about 6000 books - literary heritage writers, philosophers and poets. This light and modern context as if intended to breathe new life into the eternal values, brushing the dust from them and lighting the way "up the ladder". "Magic" staircase with each step coming revealed to him in a new light and from a different angle, sometimes completely unexpected, but always fascinating. Spiral circular composition library provides an excellent opportunity aesthetic and convenience distribution of books.